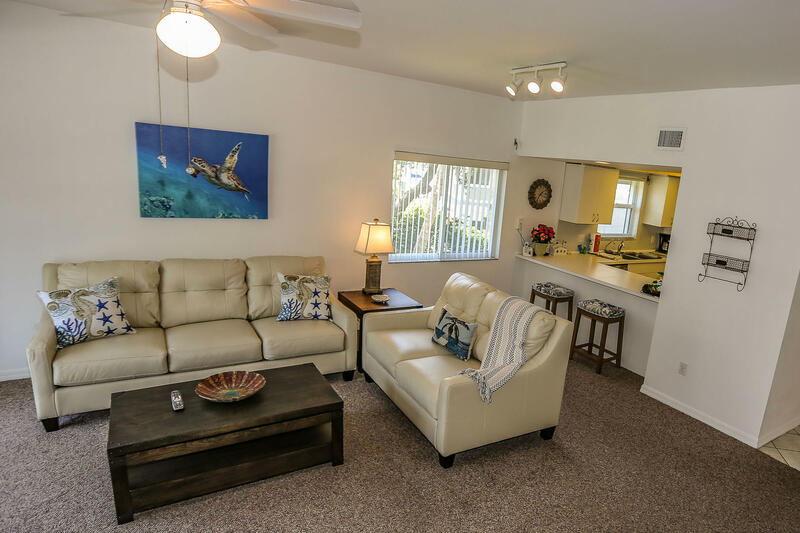 These are the three words you'll think of when remembering your time spent at Casa Marina Condo 134: Relaxing, Peaceful, Convenient. 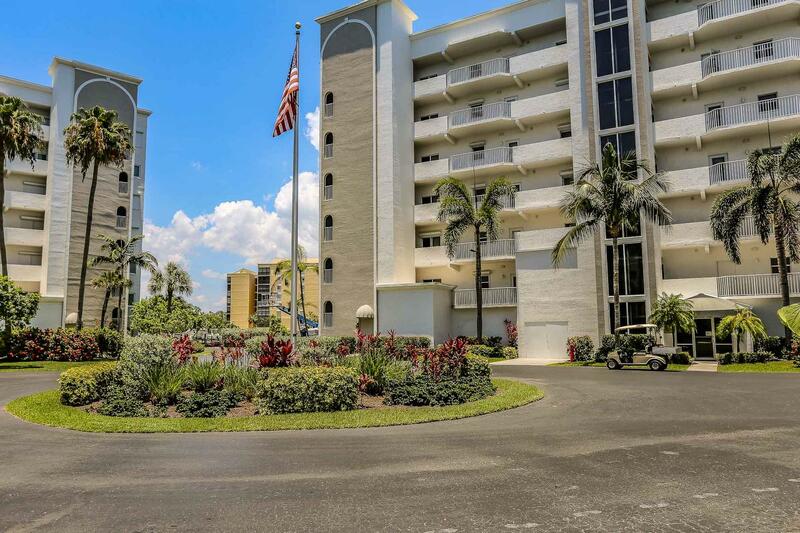 This beautiful, two bedroom, two bath, corner unit condo is located on an elevated 1st floor. 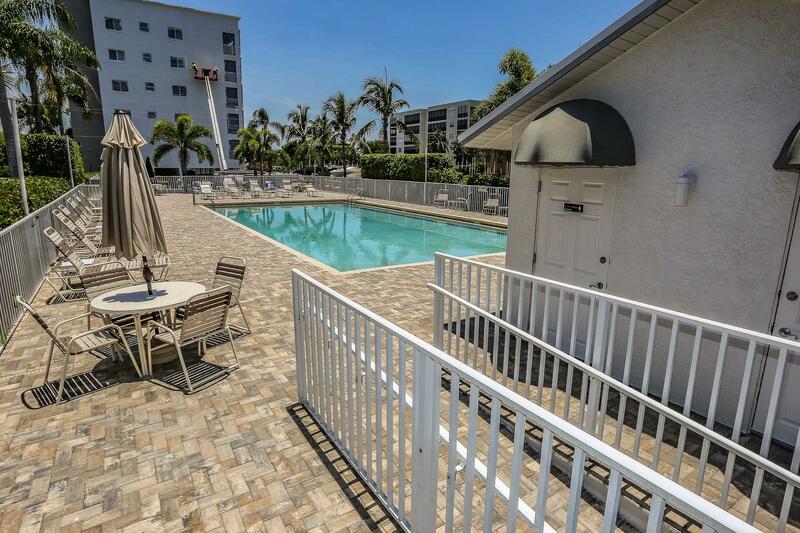 The building itself is located directly beside the pool, giving you easy swimming and sunning access from your condo. 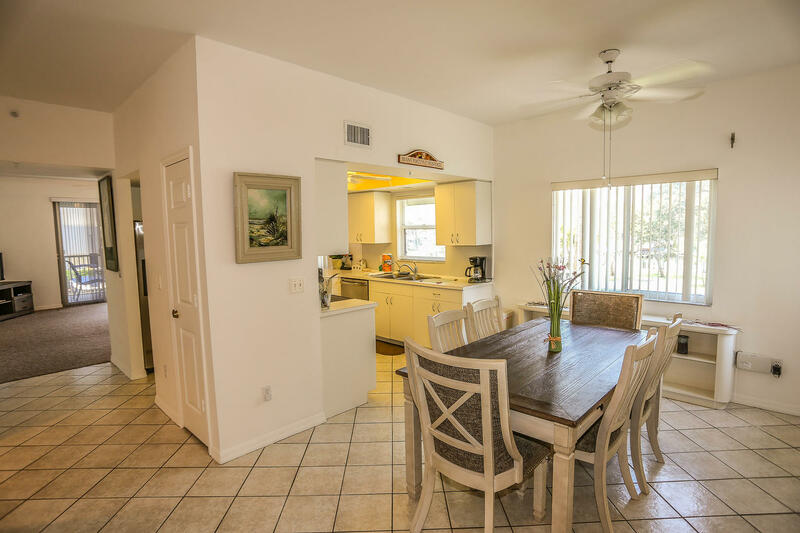 This corner unit is situated on the other side of the pool, providing you with peace and quiet while still enjoying close proximity to the pool area. 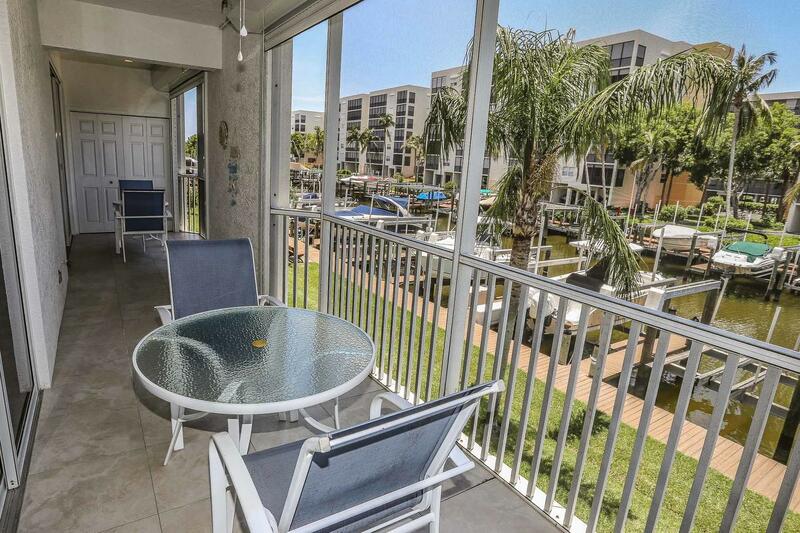 Enjoy the fabulous, calming views of Estero Bay. 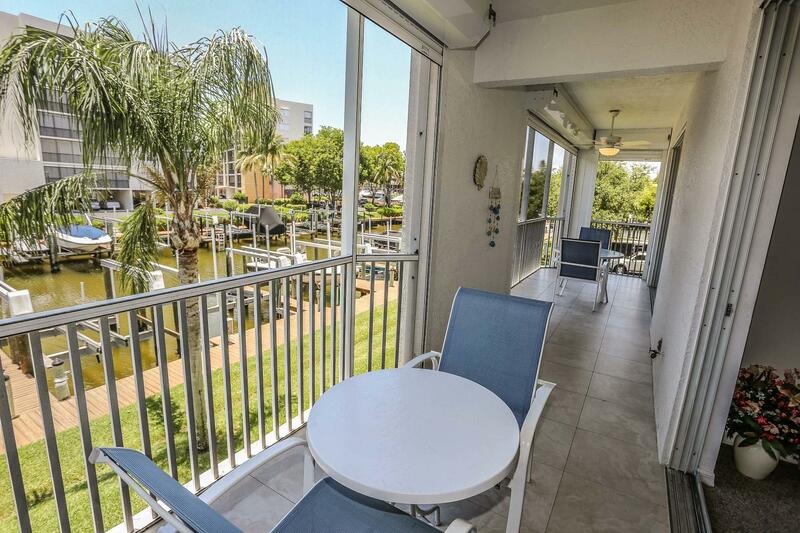 Every window provides a different view of the island of Fort Myers Beach. You may visit for just a week, but you'll want to stay for a lifetime. 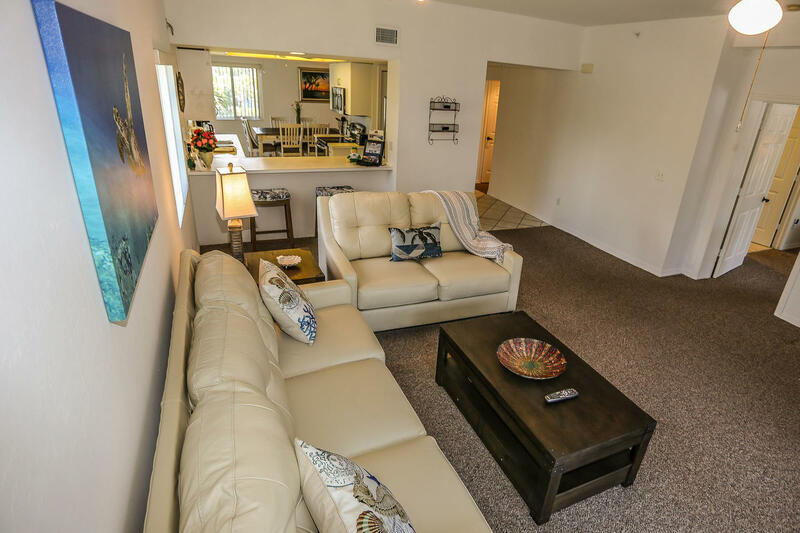 Relax in the laid back atmosphere of island living. 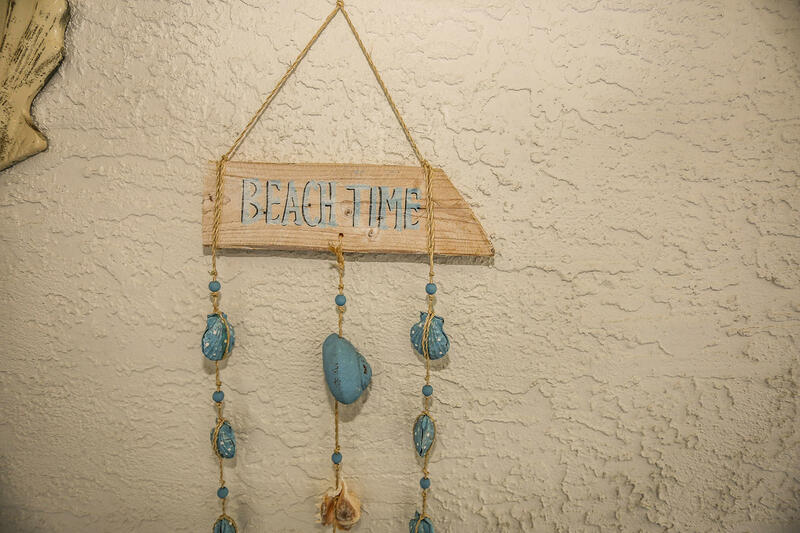 Wind down from the stress of every day life and live on what the locals call island time. 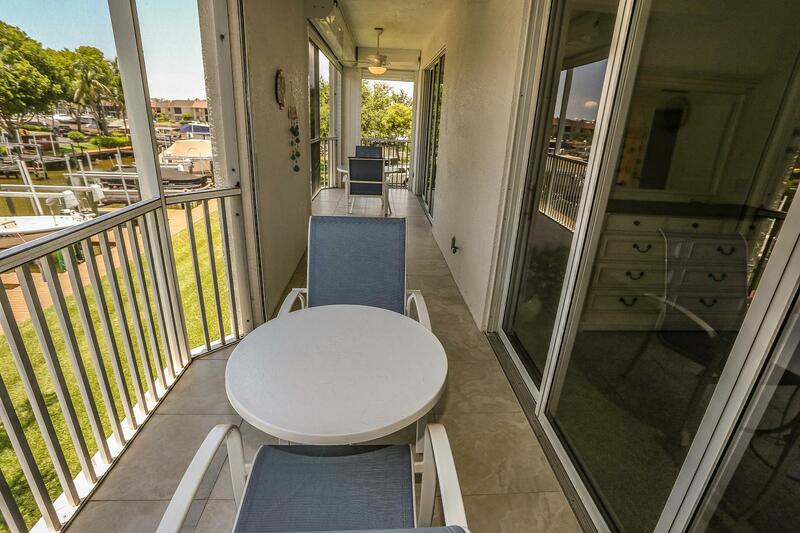 Reconnect with your family and friends while staying at our condo, feeling the tranquility. 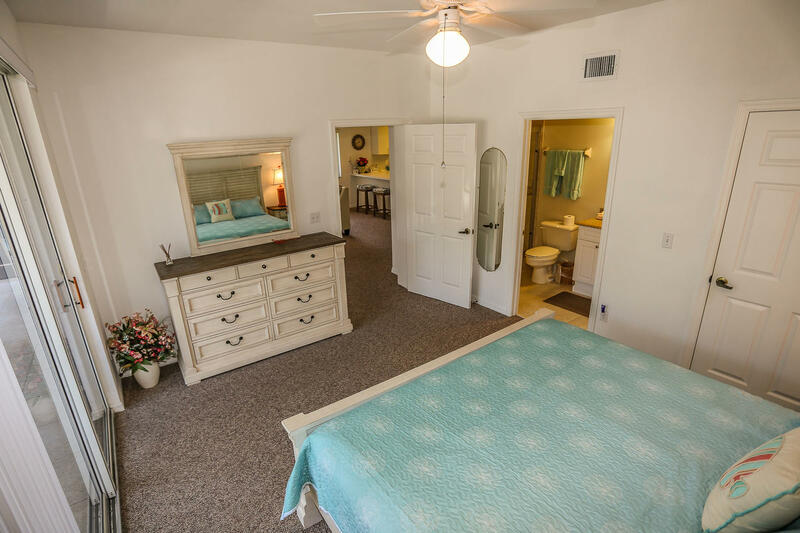 The spacious master suite boasts a king size bed and full private ensuite bath. 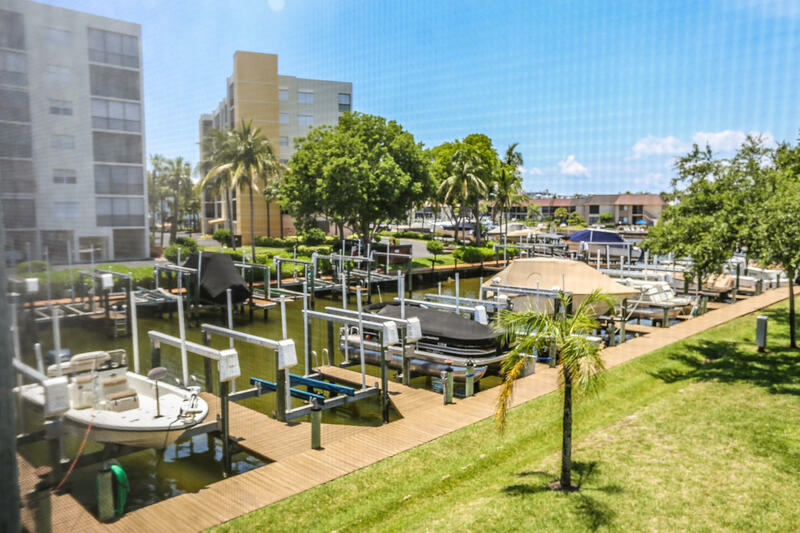 Slumber peacefully and wake refreshed to the views of Estero Bay, and the intersecting canals, from your master suite balcony. 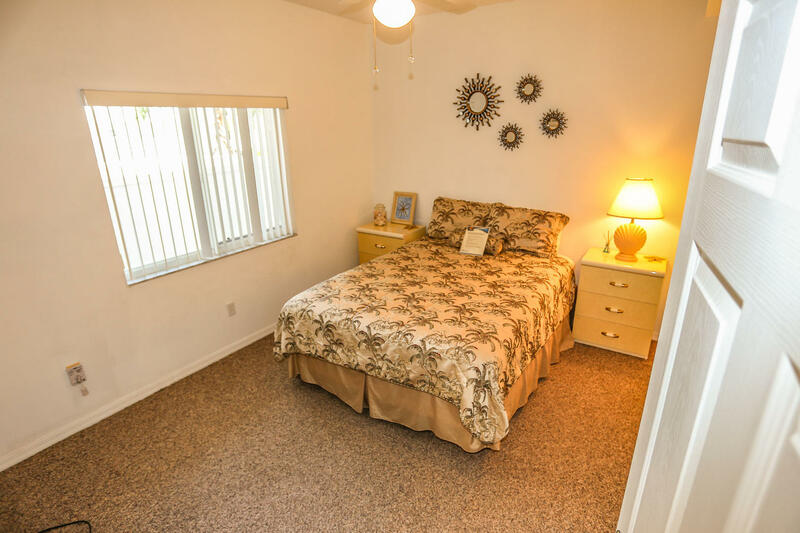 The guest bedroom is complete with a queen size bed, TV with VHS player and a separate full bathroom. There is also a queen size sleeper sofa in the living room sectional which can accommodate two additional guests as well. 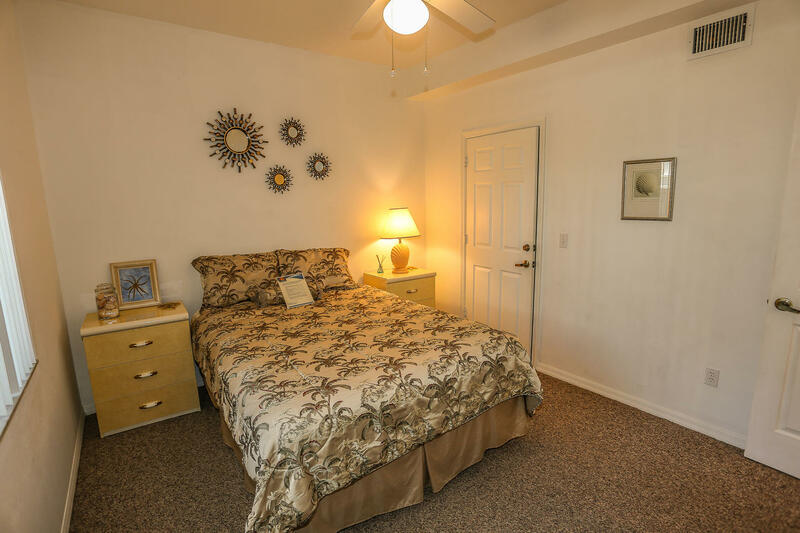 Both bedrooms offer ceiling fans for additional cooling options beside the central a/c. 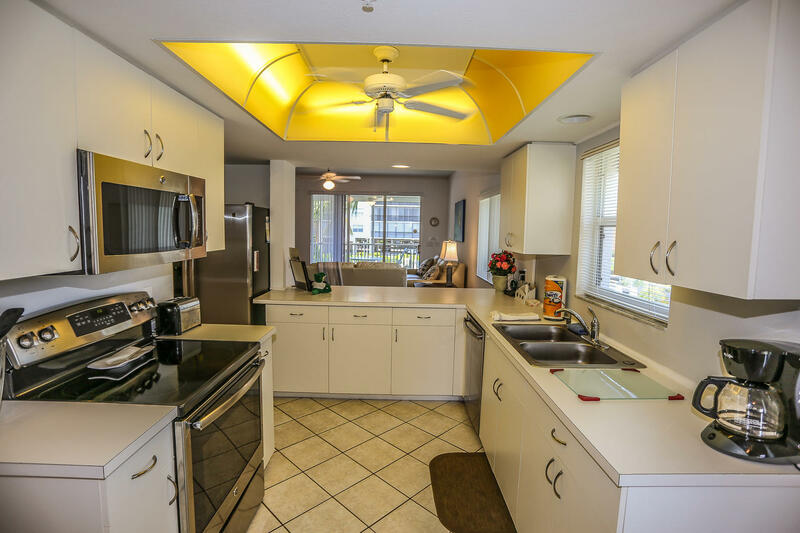 The kitchen is equipped with modern, newer appliances, and every amenity you could want or need during your stay. 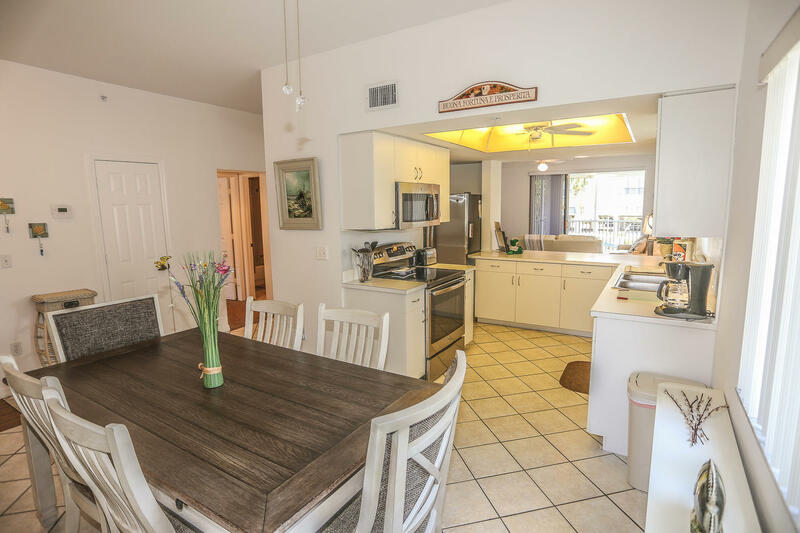 The open floor plan of this condo allows you to both entertain your guests and prepare delicious drinks and meals at the same time. 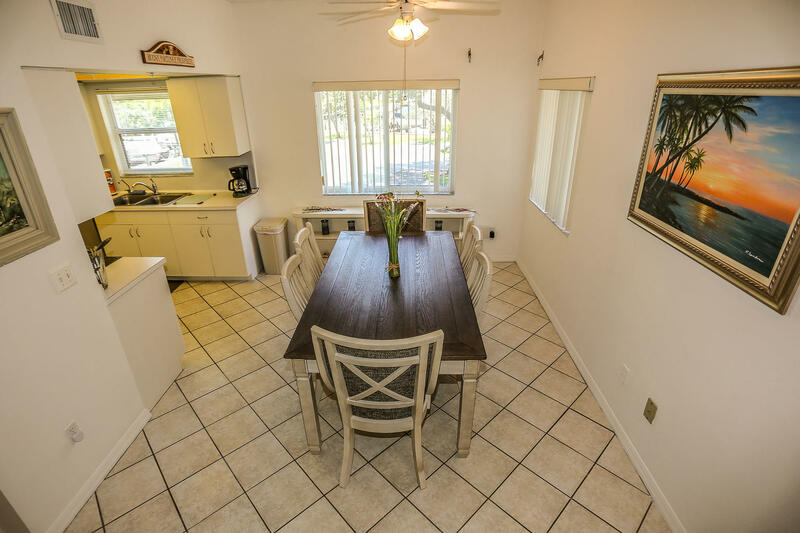 Enjoy your meals at the formal dining table, in the dining room, at the breakfast bar, or while sitting out on the screened in porch. The living room warmly invites you in to sit down, relax, and forget the stresses of everyday life. Watch your favorite TV show, read a good book, or enjoy one of the numerous movies from our movie collection on the DVD player. 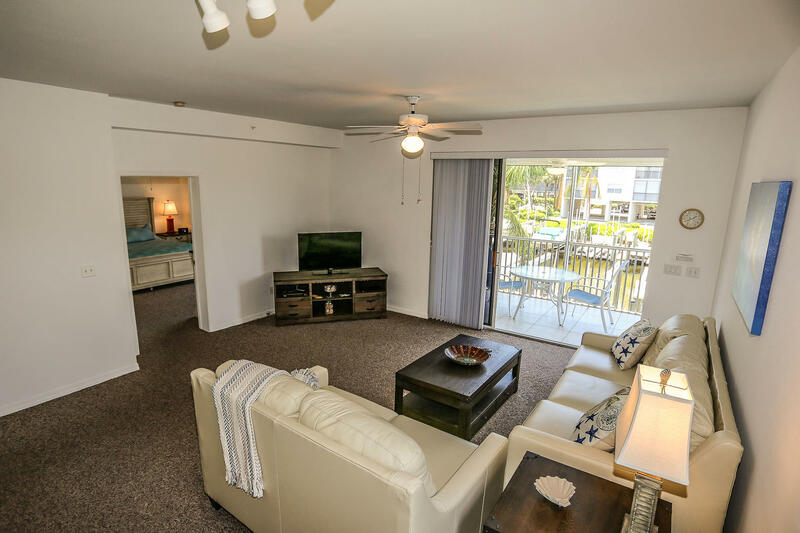 The living room opens to the large screened in porch, where you can feel the Bay breeze, smell the salt water, and take in the beautiful views of Fort Myers Beach. 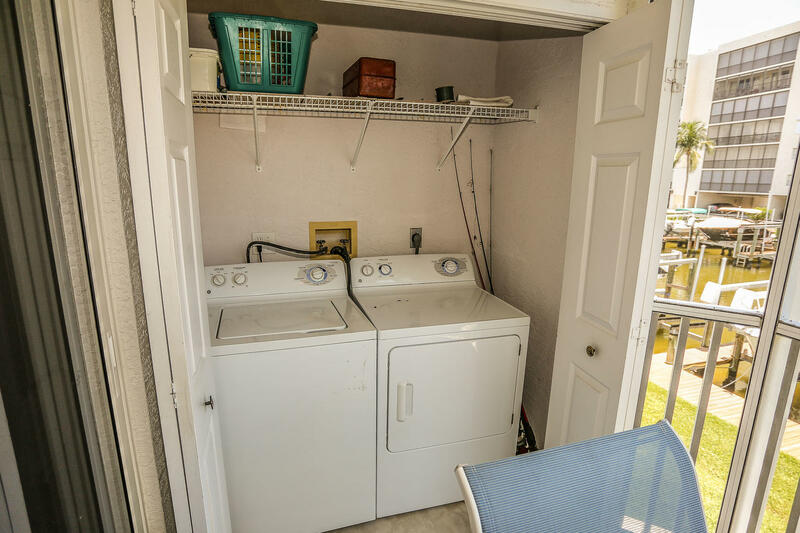 The lanai/porch area also contains your full sized washer and dryer for your use during your stay. 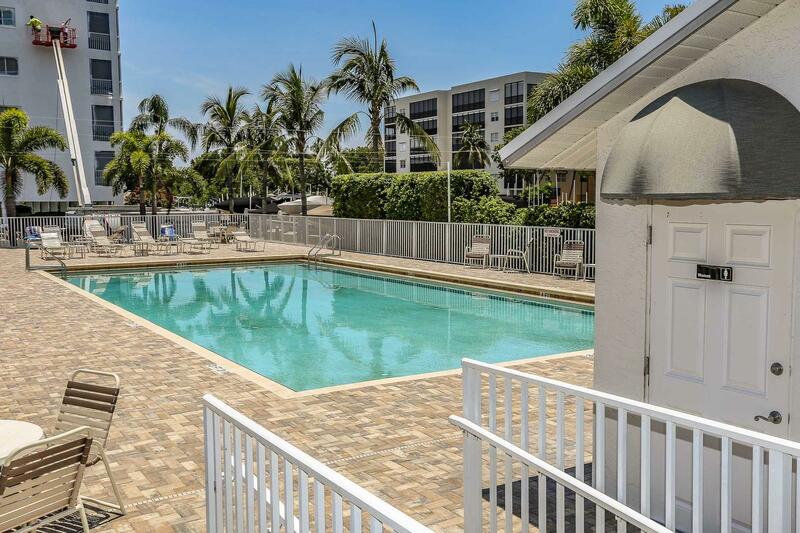 Casa Marina boasts a very large, 27x57 foot, in-ground heated pool with a morning water aerobics program for those who want to get involved, stay fit, and meet others. Water aerobics not your cup of tea? No problem. Relax poolside on the comfortable lounging furniture and read a book or take an afternoon siesta. 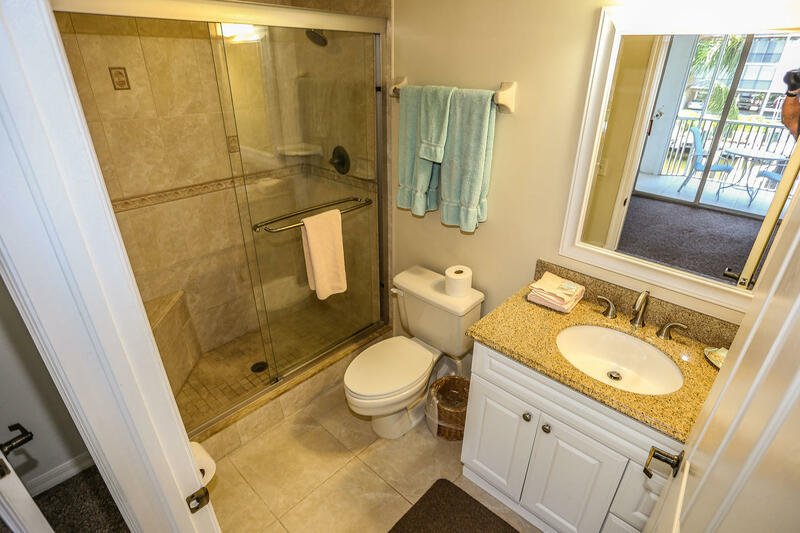 There are also poolside restrooms for your convenience. For those who might be interested in renting a boat or personal watercraft, or if you'll be bringing your own, we have boat slips available for your use during your stay. 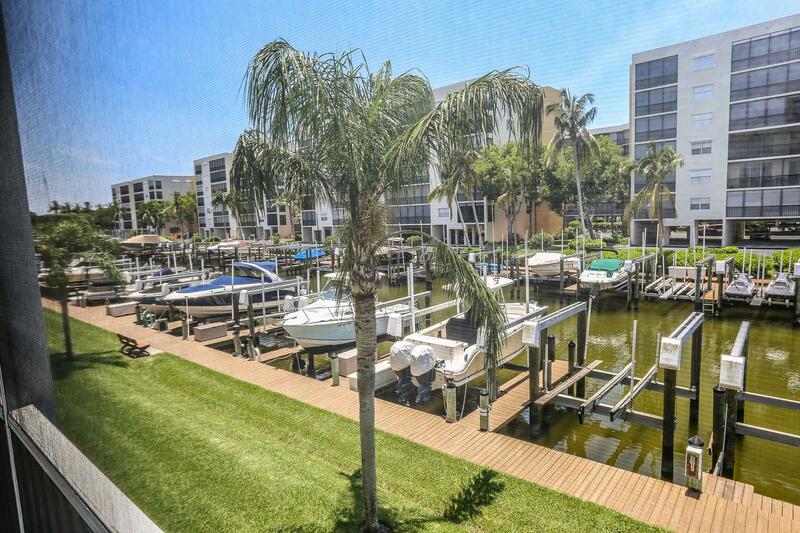 The canals on either side of the complex offer excellent fishing right from the dock. You can also spot dolphins and manatees swimming through as well. Enjoy golfing? 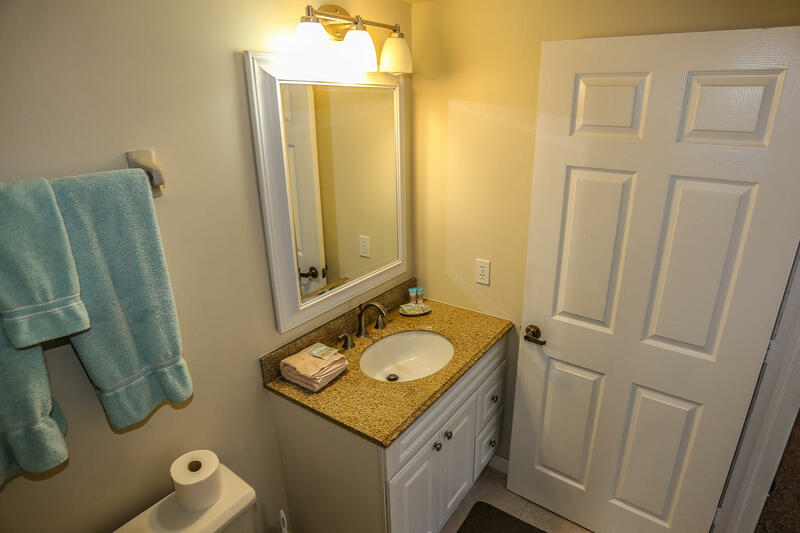 This is the condo for you! 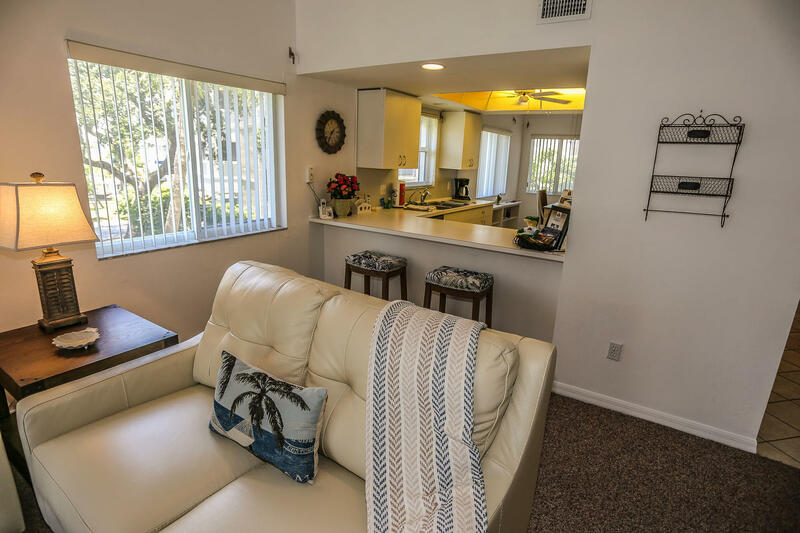 Located right next to the utive-style, public golf course on Fort Myers Beach, known as Bay Beach, you can walk out the condo and right to the course. Grab a cart or walk and get some extra exercise. Check out Bay Beach Golf Course at www.fmbgolfclub.com for full details on the course and rates. 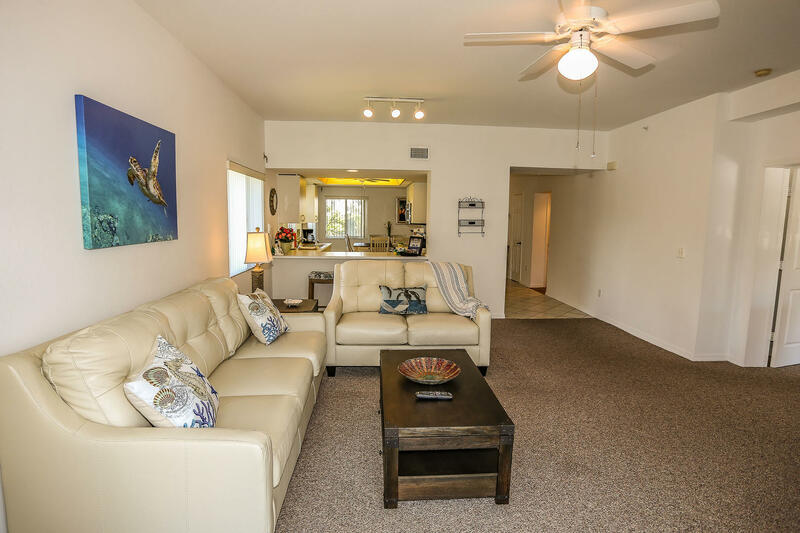 Casa Marina complex is located towards the South end of the island on Fort Myers Beach. Trolley stops going both North and South are located at the end of the road, just a short walk away. 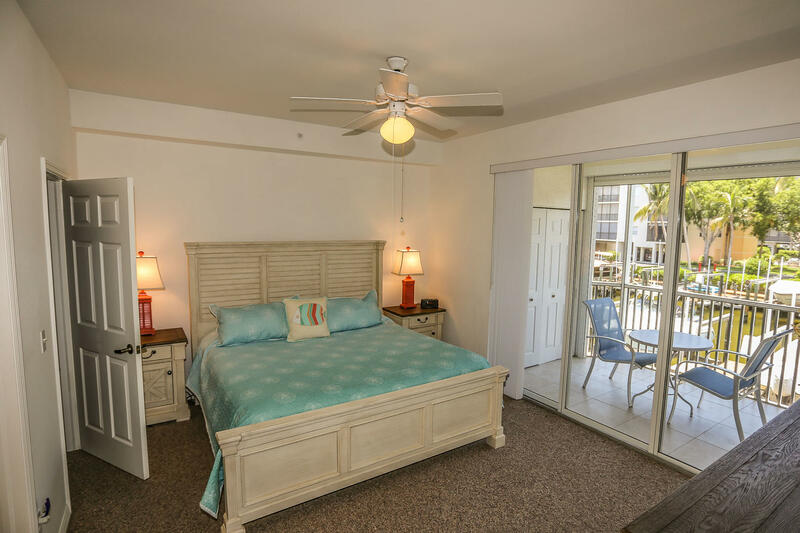 Enjoy the 7 miles of sugar sand beach, and some of the widest parts of the beach on the island. 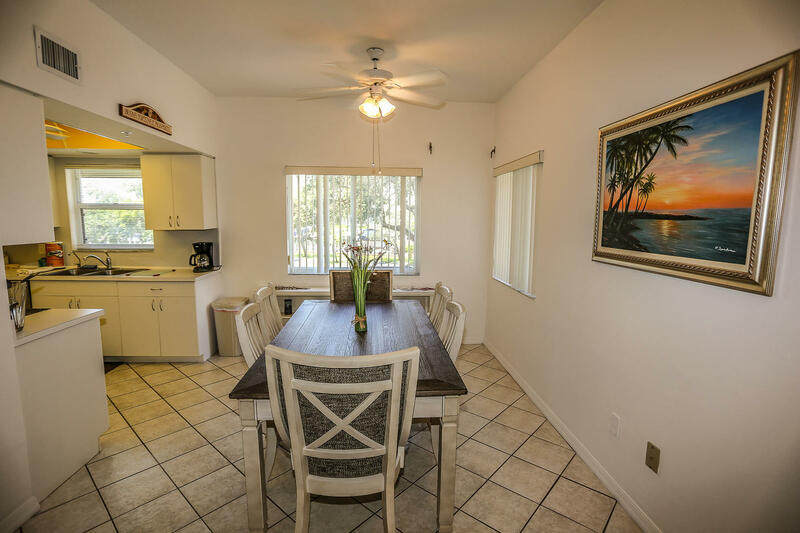 Casa Marina is centrally located to shops, restaurants, the movie theatre, groceries, post office, and much more. 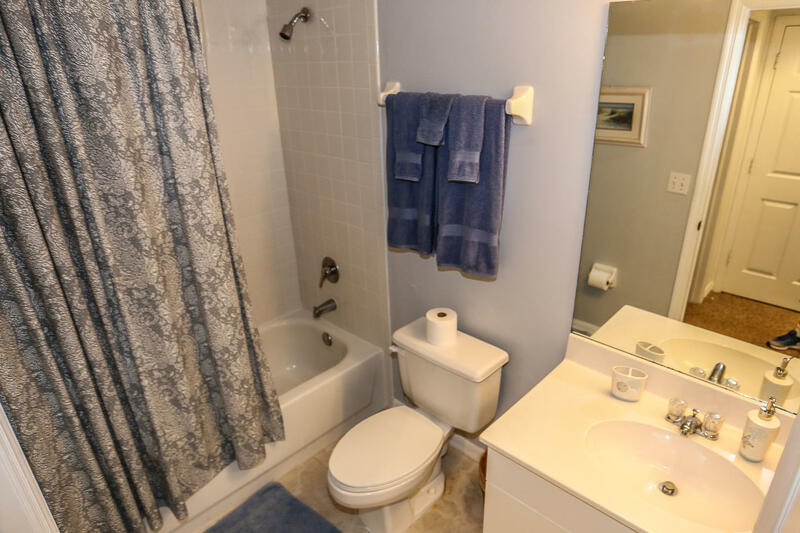 Everything is within walking distance to the condo. For those who want a truly relaxing vacation, we offer to our guests our full concierge service, daily housekeeping and turn down services. Let us know how our concierge can assist you. We can arrange for special occasion items to be waiting for you, or that special someone in your party, upon your arrival. 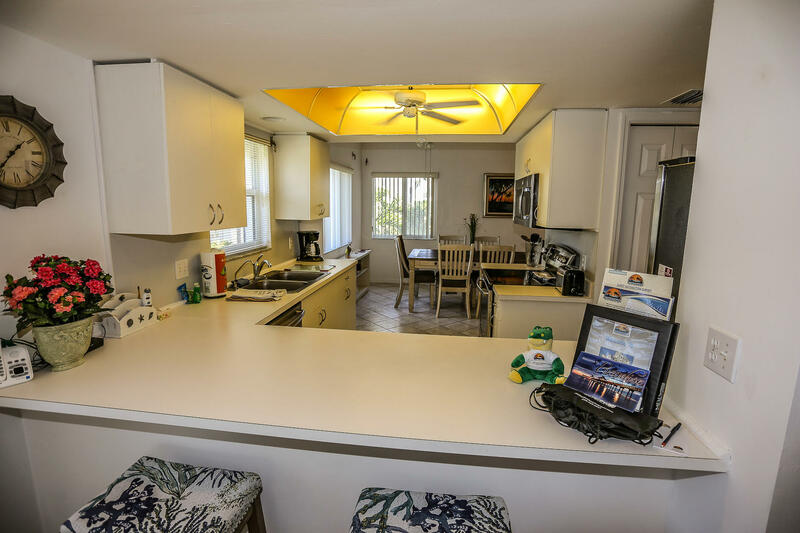 Groceries, fresh fruit baskets, floral arrangements, a Harley rental, boat rentals, limo/dinner packages, an in house massage, are all things that we can arrange for you to make your vacation ultra special. Need bikes to scoot around on the island with? Kayaks to explore Estero Bay with? A crib or high chair for a little one? Let us know. We offer a full rental department for those ''extra'' items that you may need or don't want to bring with you. Everything is delivered to you for your arrival and picked up the day of your departure. 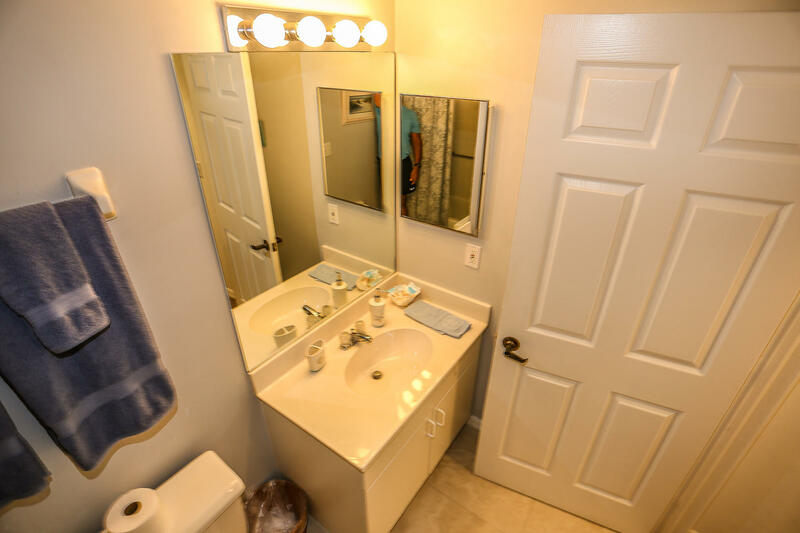 So you can relax and enjoy your vacation in paradise.